In a television interview, Bulgaria’s Foreign Minister Ekaterina Zaharieva has criticised President Roumen Radev over his months-long delay in signing the appointments of ambassadors and over his behaviour on the Venezuela issue. Bulgarian law provides the government to nominate ambassadors and for the president, as head of state, to decree them. The country has a history of tensions on the issue when the government and head of state come from different parties. 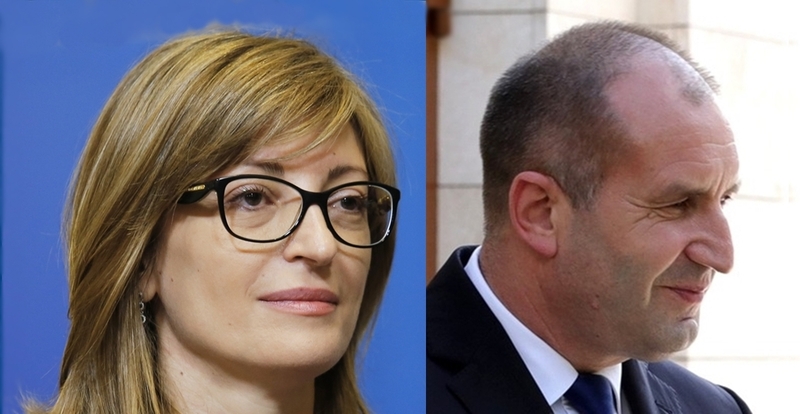 The issue of ambassadorial appointments is just one over which there are tensions between Prime Minister Boiko Borissov’s coalition government and Radev, in office on a ticket that was backed by the opposition Bulgarian Socialist Party. Zaharieva said that months ago, the government had sent the president’s office a list of about 15 names of ambassadors-designate, but Radev had yet to decree them. She cited the post of Bulgarian ambassador to Norway as an example where a vacancy remained. Previous media reports have named ambassadorial posts in sundry significant capitals in Europe where Radev has not agreed with the government’s nominations. Zaharieva, a senior member of Borissov’s centre-right GERB party, said that he had committed herself to agreeing with the president on nominations before the formal appointment procedure was initiated. She said that where the president himself had proposed names, she had “almost immediately agreed with almost everyone”. Venezuela has been a bone of contention between Bulgaria’s government and president in recent days. Taking a line similar to that of Putin’s Moscow, Radev posted on social networks on February 4 the view that the proposed EU stance to back Juan Guaidó as interim President of Venezuela was not acceptable. This line was echoed two days later by the Bulgarian Socialist Party. On February 4, a few hours after Radev’s comment, Zaharieva’s Foreign Ministry issued a statement effectively endorsing Guaidó as Venezuela’s interim President. This was formalised at a Cabinet meeting on February 6, after the Cabinet security council met on the issue. At that security council meeting, the representatives of the President’s office dissented. Zaharieva said that Radev had decided to announce his position on social networks a day before the Cabinet security council meeting, adding that the meeting had been convened before Radev made his move. She said that Bulgaria had no geostrategic interest in Venezuela, but had been called on by five countries to support a position in favour of democratisation of that country, and in favour of its people and efforts to calm tensions.